Through its considerable support for the F1 in Schools programme, City University London is playing its role in popularising motorsport among schoolchildren. More crucially, City is assisting in positively re-shaping the image of science, technology, engineering and mathematics (STEM) subjects in schools. 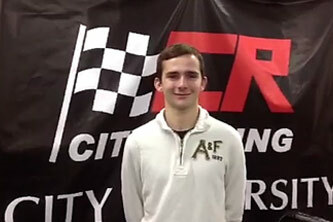 City has this year awarded a three-year scholarship to Edward Talboys (pictured at left), to study for a BEng in Automotive and Motorsport Engineering. Talboys says he is "delighted to be studying at City" and is aiming for a career in Formula One motorsport.Team Dynamic, of which Talboys was part in 2011, came fourth overall in the F1 in Schools World Final in Malaysia, held in September 2011. Earlier in the month during Open Day on 6 October, City hosted 'Team Rush', from Robert May's School in Odiham, Hampshire. 'Team Rush' will be competing at the Eighth F1 in Schools World Final which takes place in Abu Dhabi from 29-31 October. 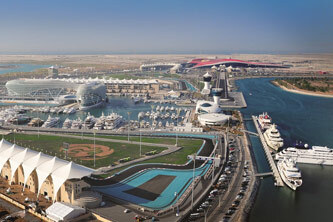 This also coincides with the 2012 Formula One Etihad Airways Grand Prix, also taking place in Abu Dhabi. At stake at the Yas Marina circuit in Abu Dhabi (pictured below) is the much-coveted Bernie Ecclestone Trophy and an opportunity to win City scholarships to study for an Automotive and Motorsport engineering degree. F1 in Schools aims to assist in changing the way science, technology, engineering and mathematics (STEM) is viewed by creating a fun and exciting learning environment for young people to develop an informed view about careers in engineering, Formula One, science, marketing and technology. Students are given a brief to design a model compressed air powered F1™ Car of the future using computer-aided design/computer-aided manufacturing (CAD/CAM) engineering techniques. Cars are then manufactured on a computer numerical control (CNC) machine. Each team of between three and six students brings together their portfolio of work to present to a judging panel with a verbal and written presentation to support their model car, which is raced on a specially-designed test track. At the World Finals each team will have an opportunity to bring along a pit display, their cars and portfolio, as well as having prepared a verbal presentation for the judges. Roger Valsler, who is the Information Technology Co-Supervisor and Formula Student Competition Supervisor (part-time) at City, is a senior judge at the Abu Dhabi F1 in Schools final. The cars race on a 20 metre track, with the cars covering the distance in just over one second, a speed barrier which is yet to be broken by any student team since it was set by Team FUGA from Northern Ireland at the 2007 World Finals with a time of 1.020 seconds. The F1 in Schools programme operates in over 40 countries. Each of the National Champions is invited to compete at the World Finals and runners-up are invited to participate by forming a collaboration team, linking with a runners-up team from another country. The collaboration teams communicate by virtual technologies such as CISCO WebEx before finally meeting each other for the first time when they arrive in Abu Dhabi. Alongside City, there are a host of supporters and sponsors for F1 in Schools including Yas Marina Circuit, Ferrari World, Etihad Airways, and the Institution of Engineering and Technology.